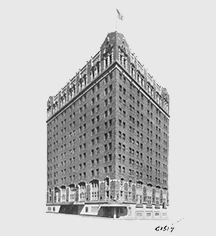 Construction of Hotel President began in 1924 by architectural firm Shepard & Wiser. Celebrating its opening in 1926 as one of Kansas City's original grand hotels, Hotel President offered 453 guestrooms and was the city's first hotel to make ice on premise. In 1928, the hotel served as the headquarters for the 1928 Republican National Convention, which nominated Herbert Hoover for president. 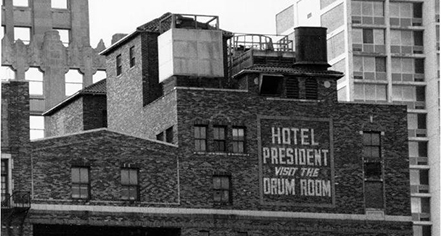 Opening in 1941, the renowned restaurant and lounge Drum Room was a legendary venue in its heyday, having hosted several luminaries and celebrated artists, including Benny Goodman, Tommy Dorsey, Glenn Miller, Frank Sinatra, and Sammy Davis Jr. The hotel closed its doors in 1980, and underwent a $45.4 million restoration project meeting the exacting specifications of the National Historic Preservation Society in many areas of the hotel. To meet the modern standards of luxury accommodations, guestrooms were enlarged to offer a total of 213 guestrooms and suites. In keeping with preservation requirements, and to maintain the look of the original hallways, there are eight faux doors on each floor. In January 2006, the hotel reopened as Hilton President Kansas City and has since maintained its celebrated heritage without sacrificing modern conveniences. At least four U.S. Presidents - Hoover, Truman, Eisenhower, and Nixon - each stayed or visited the hotel. Charles Lindbergh, the Marx brothers, Sammy Davis, Jr., and Bob Dylan are among the well-known celebrities who have been guests. The Hotel President was listed on the National Register of Historic Places on August 08, 1983.